Pete Doherty is planning yet another reformation of The Libertines, in an attempt to get his career back on track after being kicked out of his latest drug rehab clinic in Thailand. 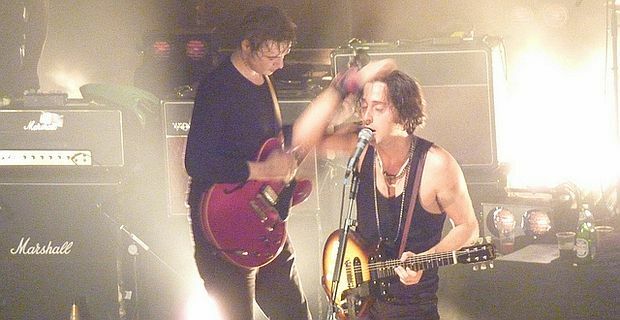 Doherty is back at home in Paris and has invited his old Libertines songwriting partner Carl Barat to work on new material. "I spoke to Carl yesterday," he told an online TV station, "and he’s going to come out to Paris. Then maybe we'll go back out to Thailand together and do some writing." Barat and Doherty’s relationship has been rocky to say the least. On one occasion Doherty even broke into Barat’s flat and stole some of his possessions. What is also apparent though is that neither of them has a particularly successful solo career. The last year has been difficult for Doherty even by his standards. His acting debut in Confessions Of A Child Of The Century was widely ridiculed, he was thrown out of rehab for being disruptive and recently had to pay £10,000 compensation for plagiarising a lyric on a Babyshambles song. He thinks that he and Barat have resolved their differences, and that the band has a future. "A future where we get together and make really good music," he recently suggested in NME. "We've never not been a band. I really feel like it's easier being in his company now than it was in our heyday. I hate to say it, but it's true – we've kind of grown up." That remains to be seen. Doherty’s recent turmoil suggests it might be a bit premature to claim maturity.